San Jose Police Using Head Cam’s. San Jose Police have begun a pilot program “head cams” in which video cameras are being placed on the heads of Police Officers to record their actions. More and more we are observing news media, bloggers and amateur video’s of police interaction with civilians. Usually it’s the controversial incidents that wind up on YOUTUBE such as Police using force against a person or group of people. Recently one such video posted on YOUTUBE stirred strong emotions Police Officer displayed his gun where a large crowd had gathered and were throwing snowballs. Most Police Agencies now have vehicle dashboard mounted cameras to record incidents. The are material evidence which can bolster the police narrative of events. If police misconduct occurs it will also be documented and both departmental and criminal discipline may result. Digital plate readers are now being used, as well as all types of recording devices in what Jeremy Bentham described as invisible omniscience. Is it logical technological progression for Officers paid by the public to record their daily performance. Is it overly intrusive. 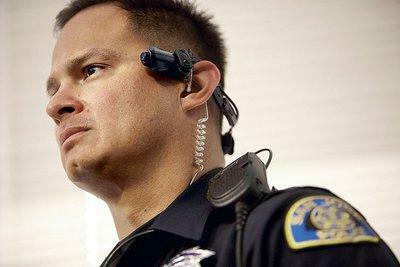 If Police are recorded 24/7 should teachers, pilots, judges, elected officials also be required to wear such a device? One of the conventional thoughts of wisdom has been that as the economy headed south, crime would rise throughout the nation. The so called economic – crime correlation. In many parts of the nation the opposite is true crime has not increased dramatically. However Police Officer’s deaths in the performance of duty has increased compared to last year. 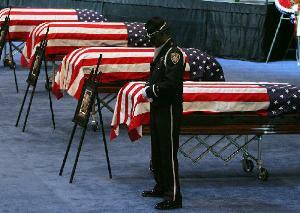 USA Today reports that for the first half of 2009 there has been a 20% increase in Police Officer line of duty deaths. You have to keep things in perspective as the totlal number of Officers slain or killed on duty is the lowest since 1965. In one photo they are standing with the Marine White House Guard, young men chosen no doubt because of their bravery and outstanding performance during war-time operations. They took pictures with real war national heroes. They used the heroes because in their world the Marine Guard were nothing more than Madame Trudeau Wax Museum props. Trust me they have no shame, they have no guilt and will demand they be viewed as patriots for exposing lack Secret Service security measures. That the President’ was holding a State affair to honor his guest surrounded by important guest who could improve relations between two nations has now been overshadowed by this criminal act. Tareq and Michaele Salahi are not alone but they raise the bar on deviant behavior without borders. They are Traitors and Burglars they intentionally, and knowingly trespassed into the White House with the conscious objective to self promote themselves with a reckless disregard for the trouble and embarrassment they would cause to the nation . No doubt heads will roll, but the proximate cause of this was these two low life’s. Mark Sullivan who rose threw the ranks to be the Director of the Secret Service may be fired because of these two. ( See http://www.secretservice.gov/director.shtml). Without being a conspirator guy did these folks act alone. Was someone bribed to allow these phony’s to obtain high level clearance? Just as with the wizards of wall street they don’t care about anyone, anybody, anyhow, they just want their money, their publicity. That they embarrassed the President the White House staff and Secret Service is inconsequential. Just like Wall Street and the Banks that they harmed the nation and good health of the nation they got their piece of the pie and the hell with everyone else. Yesterday on Long Island New York Judge Spinner in INDY MAC v YANO HOROSKI http://www.courts.state.ny.us/courts/10jd/suffolk/pdf/foreprogramrules.pdf held in essence that a bank who is seeking foreclosure against a homeowner whose is in default must act in good faith http://legal-dictionary.thefreedictionary.com/good+faith and negotiate in good faith in an attempt to medicate damages. The Judge stated ” The judge concluded that the banks’ conduct was “wholly unsupportable at law or in equity, greatly egregious and so completely devoid of good faith that equity cannot be permitted to intervene on its behalf.” However he went further stating that the banks conduct made him believe they would repeat this conduct, and a penalty would not therefore be a deterrent. SO HE EXTINGUISHED THE ENTIRE DEBT. Facts. Ms Yano Horoski a college professor refinanced her existing mortgage and refinanced the residence for $ 292,500.00 with an adjustable whose interest rate went from 10% to 12%. Part of the monies in the refinancing went to her husband’s home doll collection business. Apparently due to some financial and medical issues they could no longer afford the mortgage. As such they approached the lender. The Judge held that the family made several efforts to mediate the matter including one in which her daughter would purchase the home. But the law firm Steven J Baum http://www.mbaum.com/SJB/index.jsp attorney would not agree to anything but foreclosure. Steven Baum is the dominant law firm in New York representing banks in foreclosure sales and “short sales”. They never permit any changes in a contract, and in fact are aggressive . In their contracts they only give a purchaser 30 days to obtain a mortgage and if you don’t monetary penalties kick in which are in my opinion draconian and penalize purchaser’s unfairly. I’m glad the Judge slammed the lenders and their attorney who all benefit from taxpayer “TARP” bailout monies but treat consumers like garbage. Police Critics Cry "brutality" in Bart Officer's Removal of Man From Train. Officer’s are permitted under the law to use physical force to restrain a person. Just as an emergency physician makes decisions based upon training and experience, so do police officers. While verbal communications are frequently used to command an individual they are only used where feasible. Here the Officer makes a decision to remove the man rapidly and thus protect the citizens from potential harm. Police misconduct which is now labeled “brutality” ( defined as ruthless, cruel or harsh see http://www.thefreedictionary.com/brutality) is over and misused by those who are anti police. In this video nothing ruthless, cruel or harsh intentionally took place. The Officer correctly took physical charge of an apparent emotionally charged individual. The Officer doesn’t know if he is high on a controlled substance, armed with a weapon or in need of medical treatment. Removing him from the train protects citizens from a possible dangerous man and the Officer places himself at physical risk in a possible mano e mano encounter. If the window was made out of shatter proof glass such as plexi- glass I doubt this video would have raised an eye. It is standard police procedure to “brace” a person against a wall. This allows a Police Officer to protect himself and the subject from injury. Here the Officer used the lowest level of force “physical” to control the subject but for the glass shattering no one would have been injured. Police supervisors and elected officials have an affirmative obligation to support the police when they act properly. I see nothing in this video which displays aggressive misconduct. In fact the Officer himself was injured the video recording has witnesses stating the police acted properly and the officer quickly handcuffed the man to prevent further injury. If San Francisco as a city is opposed to this encounter they will chill officers from doing their duty. They will not proactively engage criminals nor put themselves at risk for fear of civil lawsuits, personal injury and loss of employment. Over 60 person may have been murdered solely for the “fat” content of their bodies. The poor folk were lured by the prospect of employment and then slaughtered so the killers could extract their fat. They than sold it to European nations for use in the cosmetic industry. 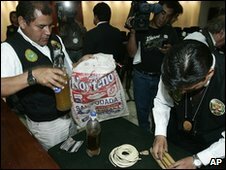 The motive for this crime is money as human fat reportedly sells for$15,000.00 a gallon. This is one of the most appalling crimes I can imagine treating a fellow human as nothing more than lard. It is sickening and the world must see if this is being replicated in other third world nations. Here are some links for this horrific crime. South African Police Kill 3 Year Old Child. Rightfully so the public is outraged at the incident and are justifiably questioning when police may discharge their guns in the performance of their duty. The father of the child is quoted from the latter article stating ” the cop just stood bye sucking a lollipop as if nothing happened.” To hear that account makes is chilling, and assuming such an account to be true would be evidence of a gross indifference to human life. If such non verbal communication was displayed it is evidence of a cold, mean, wanton and dangerous agency not accountable to the public they serve and it’s leaders should be removed. In South Africa the police may shoot at fleeing persons, ( see http://www.news24.com/Content/SouthAfrica/Politics/1057/6b50c2cf0c1940a5a24feff9efabfdc1/12-11-2009-06-06/Zuma_SA_crime_more_violent )which is not permissable in New York. In 2008 107 South African Police Officers were murdered during the performance of duty. This is an extremely high number of fatalities and directly correlates with the violence the nation is experiencing. ( see http://allafrica.com/stories/200909070585.html ) In 2008 in all of the United States 138 Officer’s died in the line of duty ( see http://www.odmp.org/year.php?year=2008 ). In 2008 South African Police encounters( custody and actions ) resulted in the death of 912 persons.The murder rate in South Africa is 5 times that of our nation. ( See http://en.wikipedia.org/wiki/List_of_countries_by_intentional_homicide_rate ) South Africa has seen an unbridled increase in violence which is reeking havoc and as a result the economic well-being of the nation is eroding. For if folks don’t feel safe they won’t live or work in a city, state of nation. Nothing good can come from the death of a three-year old. However, it appears that as a nation this death, and that of the soccer star reflect a national anomie which if goes unchecked will be a fatal carcinogen to the nation. In the Christian Science link below even the Ambassador to the U.S. was stalked coming home from the airport and gunfire was exchanged with his attackers. Banks Pimping The U.S. Taxpayers. Spamwise , a really nice food site with photos .